Please let me know you were here and how you found my blog. Are you an adoptee? A Biological Parent or an adoptive parent? Has my blog inspired you in any way? Blessings, and thanks for being here! Pam, great job!!!! Your blog looks great! I have said it before but i will say it again, finding you on Twitter, reading your story, then becoming your friend, and more changed my life!!!! You dragged me kicking and screaming to adress my life, past, & my pain. You not only have been on a journy, you help me and i know countless others begin and take our own journy in recovery!!!! I know i feel like i have seen you from early on bloom and grow into a person who helps people daily and has set up places where people connect, get help, & help others. Keep up the wonderful ministry you have through your blogg, Twitter, Facebook, and by being you!!!! What you have done is Nothing Short of Spimly Amazing!!!! Hugs! Love you girl! Colt- Thank you so much! You are AMAZING! You have been my awesome far-a-way fellow adoptee friend for many years now. I remember you saying, “By my adoption is different. I was adopted within the family, I know who my people are denied knowing any of their history.” Sort of dismissing any pain you may feel compared to other adoptees who know nothing. I remember we talked and talked about how the ORIGINAL TRAUMA of being separated from your birth mother was still there, and that TRAUMA is very real, and your abandonment & rejection issues stemming from that trauma are no LESS just because you were adopted by family! Your pain is REAL, and it seems after you were able to grasp that you began to heal yourself. We have ALWAYS understood one another, and we have that gifted ADOPTEE LANGUAGE that’s so rare these days. You are my buddy FOR LIFE and I can’t wait to see what God’s going to do in your life for the future. It was just 2-3 years ago we had big talks about God sending you a woman just perfect for you.. Now look… LOOK! You hung on, never gave up hope and BAM………… You will be engaged soon! I couldn’t be happier for you and I cherish our friendship! Thanks for being an amazing friend! I LOVE YOU! – Pamela J.
I found your blog today after someone posted an article you wrote on an adoptee FB page. Wow, scary how much I can relate as an adoptee. Crying as I am going through some of your posts that I could have written. Thank you for writing so honestly. I am sure there are many more adoptees who can relate as well. You articulate what I feel so well. SO glad you found my blog and you are able to relate to so much. That’s the reason I write and share my feelings. I know it means so much when you FINALLY find someone in your life that can say “I UNDERSTAND, I’VE BEEN THROUGH THAT!”. It makes a world of difference when we are told to feel a certain way growing up. I have realized that once I finally found my root issues, and my adoptee voice and I’m able to share my experience it’s brought me the most healing I can imagine. Something about sharing our biggest hurts is one of the ways I feel my pain was worth it. If I can help one adoptee out and know their feelings are NORMAL for a NOT NORMAL situation my pain is worth it. So glad you came across my blog. I recommend many adoptees to create a pen name, an anonymous name so you can write and share your feelings freely. You deserve to be heard! Your feelings are important and YOU matter! Maybe think about it… I would love to follow you! Let me share something I never share with anyone. Most people in my life who are close to me don’t even know. . I have a severe reading disorder, and this went undetected my entire life. When I was reconnected with my biological family (my brother) he shared with me his struggles and it was awe striking to me because I too had the same exact struggle in school. I have dyslexia with math also. This was so difficult to struggle thru school because no one knew my struggle. I hid it from everyone but my grades suffered big time. I always hated school and dropped out of regular school in 9th grade and went to an alternative school. It was easier to skate by that way… I’m sharing this because even when you feel like you aren’t the best writer you can still share your feelings and be empowered by doing it! I have an extremely difficult time reading and retaining what I read but I can write and share my feelings easier. But I FEELS like my writing is more “basic” than most peoples, because I didn’t develope in alot of areas like some people did. God is still using me and he’s going to use you too!! Please think about writing. I would love to follow your blog if you set one up! Thanks for the encouragement, I appreciate it. I will let you know if I decide to start one. I did it I wrotey first post on my own blog. It is under marie15715blog.wordpress.com. yeah for me. I just finished listening to your story on Adoptees On and I was very moved by it. My fiancee is adopted and his journey is somewhat similar to yours. He also had a mentally ill adoptive mother and it was not a happy upbringing. Like you, he was close to his adoptive father. His mother has Narcissistic Personality Disorder and she would fly into rages and beat my fiancee and his adoptive siblings, screaming a la Mommie Dearest. He was the black sheep and her prime target. I liked your reflections about church and religion and adoption. His parents were very prominent in the Catholic Church and his mother paraded the children around to elicit admiration from others – “Look at what a saintly adoptive mother I am with all these abandoned children.” Meanwhile the multiple adoptions were permitted by Catholic Social Services in spite of the clear evidence of child abuse. The first baby they adopted died under suspicious circumstances. She was very violent with the children. Like you, my fiancee endured a lifelong struggle with addiction. His problem substance was drugs. The years of childhood abuse and unresolved adoption issues caught up with him in spite of his high IQ and many achievements. He has CPTSD and has struggled with anxiety and depression for years. We are also Christians and truly the Hand of God was involved in our relationship. I met my fiancee in church after Mass one day. Eventually I became his “search angel” of sorts and I helped him to find his birth parents and family. He has reunited with his birth mother and some of her family. Like your mother, she struggles with alcohol and mental health issues I believe partly due to the shame and trauma of the adoption. So far, the person we believe to be his birth father is denying and rejecting, along with the family on that side. Your message of hope and healing for adoptees through Christ was such an inspiration. I plan to share your interview with my fiancee. God bless you and your important work. So honored you were able to tune into the Adoptees On interview via the podcast. Hope you are well, i came across your blog and love it! I have started my own blog in search to find my birth parents. I was wondering if you were interested in doing a post for my blog. A piece about your story and a summary of your journey. So people that might be interested from my blog might choose to come over and follow your story. My email address is sara.saliba95@gmail.com if you are interested. So glad you found my blog and have enjoyed it. I always love to hear that! Thank you for this message. 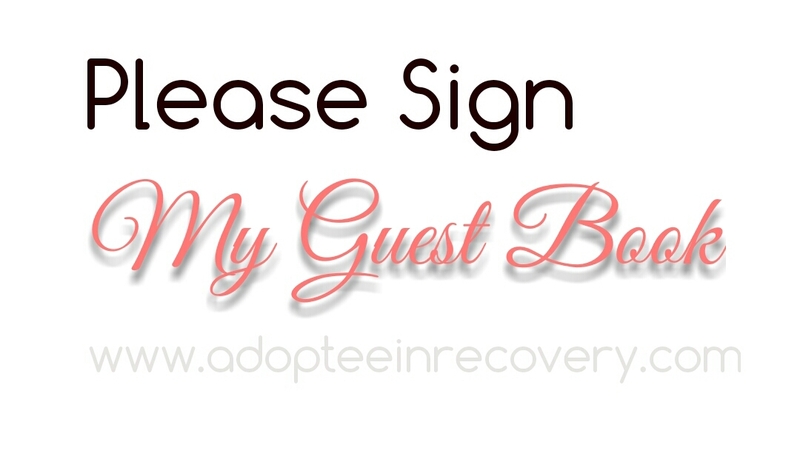 I would love to add your blog to my all adoptee blog roll if possible? Let me know when you can. It will be featured on my blog. I’m a first mom who found my daughter and reached out shortly after her 18th birthday. Even as I am SO GRATEFUL every second of the day that we are now in reunion, the truth of what my choice to be a “hero” by placing her with a family that I knew nothing about, sanctioned by two churches halfway across the country from each other has meant, has catapulted me into a near-constant search for information about adoption. I’m doing the research now about the adoption industry that I should have done 19 years ago. I’m also devouring adoptee perspectives just as fast as I can find them (lots via twitter – like I found you!) in order to better know my daughter. I wish this information was available to me then. I can only now try to do the best I can to meet whatever needs my daughter might have of me from now on. Thank you for being a part of what is *hopefully* making me better by sharing your experiences. So glad you are in reunion with your daughter. That’s music to my ears. I think it’s wonderful you have the willingness to seek insight from adoptees perspectives. This is a huge deal. It’s interesting because I can take my mind back to being your daughters age, and I knew I had all these issues but I had absolutely no one validating my feelings or anyone to share they with to try to connect the dots. The reason I’m sharing is because it is very possible that as you read and learn you might begin to understand things your daughter hasn’t even scratched the surface on yet. It will allow you to help her and better understand her as she gets older. 🙂 I commend you for having that willingness, it’s far and few between in the adoption industry. For some reason we (adoptees) are treated like perpetual children and silenced in most situations which is very sad because we hold a lot of wealth and knowledge. Your daughter is lucky to have you, vice versa. P.S. I have a list of all adoptee blogs on my website. You can find the tab at the top of the page. 😀 Great resource and tool. Pam, Thanx for putting together this web site. It helps more than you know. God is using you to reach and help others in this situation. I am also a product of a closed adoption. Its nice to know there are others that share in this pain. Well maybe nice is not the right word. I have a story to share just I have to get the courage to put it all together. Your blogs help we all have so much in common. You are more than welcome. I need to update a few things but it’s all here for you, and my fellow adoptees. At least as time progresses we can all learn we aren’t alone. That in itself is a huge thing for validation. I totally get what you are saying about it being nice to know there are others who share our experiences, and then feeling weird about saying it because we hate others experience THIS but knowing they do is so validating. I will be praying you get to a place where you can share your story. When I finally came to this place, it’s honestly been the most healing I’ve ever experienced BUT it was extremely hard to get to this place. I mean we are really conditioned at a very early age to NOT SHARE OUR REAL TRUE FEELINGS about how it feels to be adopted. So when our minds have so much going on regarding this topic, making the connection to share them and even make it public can be petrifying at best. It all takes time, and the more adoptee blogs and stories you read the more you heal by knowing you aren’t crazy for feeling the way you do, and the way we feel is natural for a not natural situation. After a period of time, you will get stronger in your abilities to share your story! It will happen. Sending you positive vibes and know you aren’t alone! Wow, I must say that I am glad to know that I am not alone. Of course there are numerous of adoptees out there but adoptees that gone through the narcissistic abuse especial from the maternal adopted parent. I have gone and still is going through this pain as well and a load of other issues revolving being a adoptee. As needless to say it’s like the adopted parents fault you for them raising you and want you to dedicate your life to them and only them when you did not ask to be adopted by them. On the other hand with the biological parents, you feel that you are at fault for existing or you owe them for carrying their blood in your veins when you did not ask to come to this world. This is what it technically feels like. I will say despite of the toxicity from my adoptive side, I appreciate my upbringing because it could of been a lot worse and on my biological side, despite the toxicity, I was not aborted or thrown in the trash or etc. As an adoptee, I have to realize that rather you are raised by adoptive parents or biological, YOU are not here or obligated to your parents when it comes to your life or to change yourself as a person for their selfishness. You would think that parents regardless of adoptive or biological should love you unconditionally but it is not always the case. I personally believe we are here for GOD’s purpose and that is more than enough. I am stuck between a rock and a hard plate and am working hard to detach from the toxicity right now. I am thankful that you made this community for us adoptees that are emotionally and psychologically or even physical in some cases wombed to have hope and to enlighten non adoptees or others of what it’s like from our perspective. I recently started to date an adoptee man. I have a psychology background I I am very familiar with the background issues of abused children, having been one, but I honestly had no idea how much people who were adopted were impacted by adoption. After dating for a month, jumped online to do research and I have been absolutely blown away by the silencing of the issue. This is one of the best sites I have spent a lot of time on, reading and reading, stories to understand how the pain has impacted your lives so I can better understand my guy. Thank you for this site, and please keep up the HONEST work. Some pains never heal, you just learn to live with them- that part I understand, so I empathize with you on that. Keep up the great work.